Laundry pods may be pretty, but the Climate Crusader discovers their ugly side. One of the hard parts of green living is finding replacements for the unsustainable, toxic products you know and love. For instance, it took me years - and taking matters into my own hands - to find a "green" deodorant I like. I faced similar struggles with dish soap, all-purpose cleaner and dishwasher detergent. It was only recently that I found a laundry detergent that both my husband and I agree works well, that doesn't cost an arm and a leg, and that I feel good about using. About a year ago someone asked me why I don't just use Tide. The argued that it's cheap and it works. And with those snazzy Pods it's as easy to use as can be. I mumbled something about toxins. But this past week I heard a news story that underscored why I spent all that time and energy looking for a non-toxic laundry detergent. It seems that laundry pods like Tide Pods pose a serious risk to young children. A study published in the journal Pediatrics found that 17,230 children under the age of six had unhealthy exposure to laundry pods in 2012-2013 - or about one every hour. About half of those children got sick, some seriously so. In fact, a seven-month-old baby died after eating a laundry pod in 2013. It's no joke. Of course, laundry detergents in general need to be kept out of reach of children. So what makes laundry pods so unsafe? In the first place, their bright colours and soft textures are very attractive. They even resemble candy. I know my own kids have seen them in the store and suggested I buy them because they thought they looked pretty. However, it's more than that. 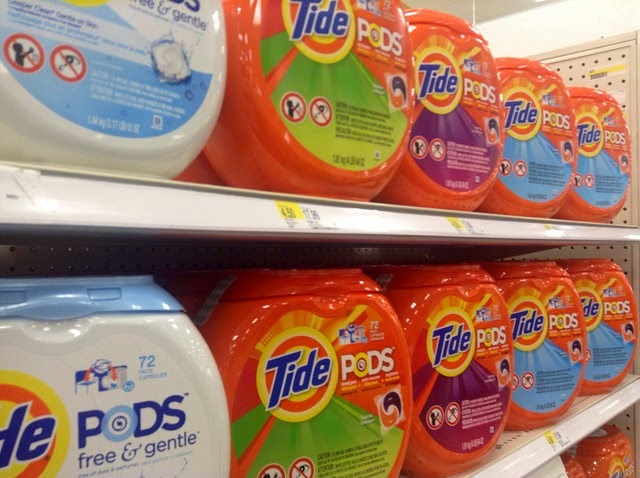 If a child bites a pod they can receive a concentrated squirt of detergent in their eyes, mouths or throats, which results in more serious injuries than when kids get their hands on traditional laundry powders and liquids. My own children are six and nine years old, so they're old enough now that I can generally trust them not to eat the laundry detergent. Still, I have to admit that the idea of keeping products around my house that can injure or kill young children makes me uncomfortable. And the idea of washing my clothes with those detergents and then washing them down the drain where they can end up in streams, rivers, lakes and oceans doesn't feel good, either. Certainly these cleaners can't be good for fish and frogs, even if they are diluted. As I mentioned up front, the journey towards greener cleaning isn't an easy one. I believe it's worthwhile, though. If you need some help getting started, check out the Environmental Working Group's Guide to Healthy Cleaning. And keep those laundry pods out of reach of children! I saw that story too. Always best to avoid using products that can accidentally poison your children, esp. when safe alternative are readily available! Yikes! I've long avoided regular detergent and, like you, made my own for a while. I had no idea though that the pods could be this dangerous. Brutal stuff! I try to make my own detergent as much as possible, and use unscented, phosphate-free, no-additive types otherwise. I have to admit though, I haven't done much of a comparative on different brand's "natural" options. I'd be interested to hear more takes on that. Didn't know the dangers of the pods, glad I've always avoided them as another example of convenience over common sense and being cheap. A side effect of avoiding commercial detergent: I really notice the scent from people who use them, quite overpowering actually. Makes me sneeze and makes my face red, which is why I started avoiding commercial cleaners in the first place.